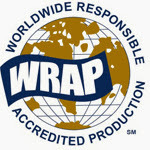 The newsletter of WRAP, Worldwide Responsible Accredited Production, might sound like dry reading. But if you're interested in the challenges facing global fashion, particularly at the fast end of the spectrum, it's a must-read. WRAP are an independent, objective, non-profit team of global social compliance experts, dedicated to promoting safe, lawful, humane, and ethical manufacturing. Their education programmes are second to none, and WRAP accreditation is a sure sign that you're dealing with an ethical business. Pier32, for example, regularly use WRAP-certified garments. WRAP have offices and influence across the globe, and a presence in all the areas where the future of fashion manufacturing is being worked out. Not, in the most case, by executives in the penthouse office of a western skyscraper, but by the workers on the factory floor, one strike at a time. You quickly start to realise when reading about global manufacturing that it's a messy, turbulent business filled with unexpected pitfalls. For example, the newsletter notes that several garment manufacturers in Bangladesh have either closed their doors or cut back on production amid violence spurred by the recent elections. At least 18 people were confirmed dead after police clashed with a group of opposition activists, who have also been accused of torching over 100 polling places in the country. Bangladesh is the place to watch at the moment. Following the Rana Plaza collapse, all eyes are on the garment factories to see what will happen next. Those of us that hoped the BFSA would put an end to workplace tragedies have, thus far, been sadly mistaken. Following a fire at the Aswad Composite Mills factory in October that killed at least 8 people, it's emerged that the owners were reportedly warned by government officials about the imminent fire danger at their facility just one week before the incident occurred. Government inspectors say that the facility was given a formal notification that the building was unsafe for work and posed significant danger to human life. The report noted that the facility's fire safety equipment was not properly maintained and that several additions to the structure had been made without approval. Things are no better in Cambodia, for different reasons. Leaders of local garment worker unions say they will push on with demonstrations for higher wages after a recent crackdown on them by the Cambodian government turned deadly. At least 4 people were killed in the New Year after police reportedly used AK-47 rifles to break up a demonstration in what is being described as some of the worst violence against Cambodian civilians in 15 years. Workers from over 500 factories across the country have been on strike demanding that the minimum wage be increased to US$160 per month--that's just under £100. This crackdown has been urged on by South Korean investors with interests in the area, reportedly using their embassy's Facebook page. In India, there's agitation by handloom workers who see their livelihood disappearing as power looms take over. Weavers are striking both against mechanisation, and products that are advertised as handwoven when they have clearly been made by a machine. Meanwhile, a new weaving institute is being set up in the Andhra Pradesh region at a cost of $5.6 million. This makes the point that, from the government point of view, handwoven goods and the skilled workers that produce them still have a place in modern India. Finally, an incentive in the United States to compel military retailers to give preferential treatment to factories signed up to the BFSA has been quietly dropped. Military-spec clothing is a juicy contract to win, and it's worth noting that pressure to drop the provision came primarily from the American based Alliance on Building and Fire Safety, the rival, watered down accord started by Gap and Walmart. They claimed that the initiative would have impacted on their own efforts to improve workplace safety in the area. Any mention of likely impacts to their profits is, of course, churlish, and this blog would not stoop so low. WRAP's unique position and access to the front line of global fashion makes it the go-to organisation for breaking news on the subject. As workers push for better wages and working conditions, we're seeing a lot of pushback from vested interests who are frequently on the other side of the globe. Things are changing quickly, and it's thanks to organisations like WRAP that we can stay informed about the war that's going on around the clothes in our wardrobe.